"...alone I cannot lift my voice in song--then you come near and sing with me. Our prayers fuse, and a new voice soars. Our bond is beyond voice and voice. Our bond is one of spirit and spirit..."
Music infuses all aspects of congregational life at Temple Beth Shalom. Ruach (spirit) pervades our music-making and worship services and we encourage everyone to join in the music at whatever level they are comfortable. Whether you are a listener, a music-maker, or a Music Committee member, there are musical opportunities for you! Please enjoy this short and sweet documentary titled Austin Revealed: In Harmony, which aired on our local PBS station, featuring choir member Jennifer Bloom Greenberg (granddaughter of Jewish baseball legend "Hammering Hank" Greenberg). The Temple Beth Shalom Kol Hakavod Ensemble sings in the background throughout much of the video and you can see us singing in our sanctuary. You'll hear parts of our member Joe Strouse's "Shalom Rav," Abby Gostein's "Mi Chamocha," and Tzvika Pik's "Shehecheyanu." helping with musically-related tasks as needed (e.g., upkeep of High Holy Day songbooks). If you're interested in participating in the music program at Temple Beth Shalom by serving as a Music Committee member please contact us at shalom@bethshalomaustin.org. "Ever since I was in Temple Teens in the 60s, music has provided me a major connection to spirituality and Ruach. 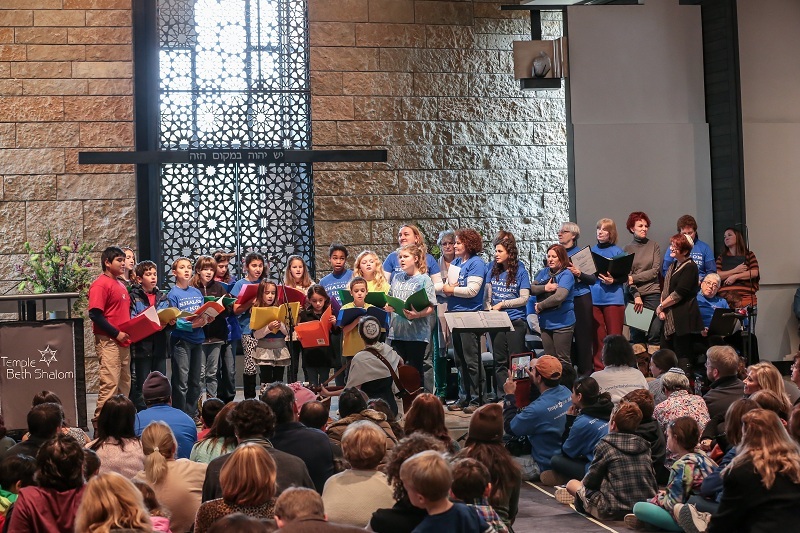 The music program at Temple Beth Shalom provides unending opportunities to connect to our spiritualism, our Judaism and our community of friends." "Music during services brings me to Shabbat, whether the music is instrumental or vocal. I used to only feel comfortable when I heard the traditional melodies of my youth. But now I can appreciate and enjoy newer arrangements of the ancient words from our liturgy. However, I feel the most connected to my heritage, the most spiritual, the most prayerful when I am singing with the Kol Hakavod ensemble." "Having the opportunity to sing such wonderful and uplifting music was a spiritual high for me. Abby's songs and arrangements kept the experience always fresh and the shared time with the other choir members provided a special sense of belonging. I'll always be grateful." "Singing and even just being part of the congregation and joining in with the choir or the cantor brings the prayers to life and adds a new significance to our emotions be they peace or joy, during the service. I am thankful for the time and talent and love put into having a choir in our congregation."